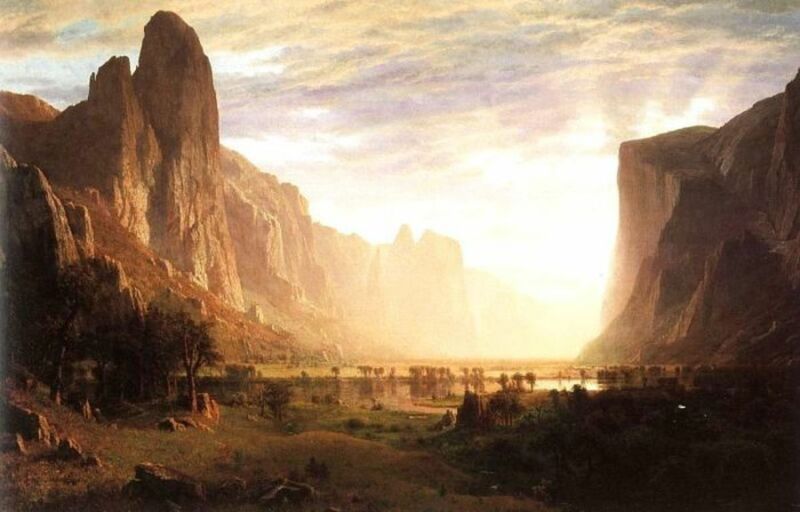 Alfred Bierstadt, "Looking Down Yosemite Valley, California"
In this article, I will discuss some of the most well-known Western artists of the 19th century. These artists were celebrated not only for their beautiful works, but also for their pioneering work in documenting the history, mythology, and ethnography of the American West. The artists of this period came from many walks of life. Some of them lived on the Western frontier and made their artistic fortunes featuring the mythic aspects of the American West. On the other hand, some of these artists never lived in the West, and a few weren't even American. The following discussion is my attempt to highlight some of the most well-known Western artists from the 19th century. You will probably recognize most of these names. This is not an attempt to select the artists who are necessarily the best or whose works fetch the highest prices. I do hope that by featuring the works of these artists, you will have an enjoyable virtual visit! Please take a moment to add to the comments section, below, to share which artist's work you liked the best. 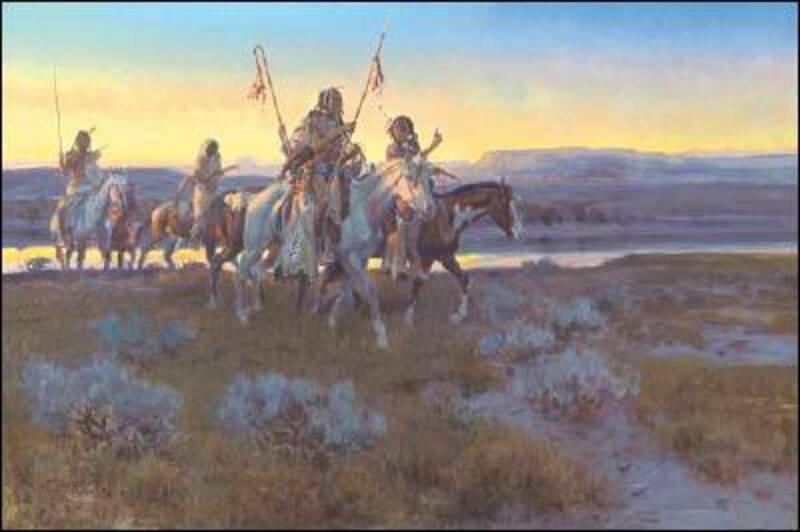 Charles Marion Russell depicted a mythic American West in his paintings. Russell's paintings are characterized by movement and have a dramatic quality. They usually feature men on horseback. Charles Marion Russell was an important and prolific Western artist. His works can be found in over 50 museums in the United States, as well as around the world. Russell was adept in several media. He painted in oils and gouache (a type of watercolor), and he also sculpted. You will find that you can view many copies of his popular cast-bronze sculptures in different venues, because bronzes are made by pouring molten metal into a mold made from the original piece of artwork. Bronze pieces are usually made in limited quantities at a foundry. The numbered copies of these bronzes are very collectible, with the first editions, usually numbered on the sculpture, like a print. Most Western art museums contain at least a few works by this influential artist. Russell's representational style included cowboys, Native Americans, and landscapes inspired by visits to national parks in California, Arizona, and Colorado. The color palettes are muted, but realistic, and his paintings and sculptures are dominated by a sense of movement and action. He depicted a mythic American West. Russell's paintings are more valuable than his sculptures, simply because their numbers are fewer. However, his sculpture is probably what he is best known for, again, because it is so prolific. Selected museums with Russell's artwork. 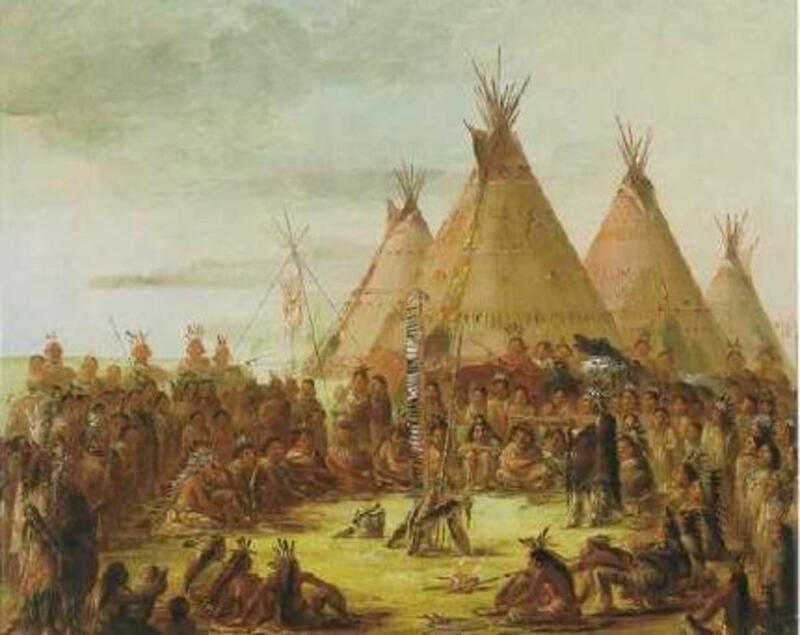 George Catlin's work depicted life among Native American societies. Catlin traveled among tribal groups with greater safety than most other settlers of European descent. This was because the Native Americans valued Catlin's record of their tribal societies. Catlin's extensive collection of tribal portraits has visually preserved information about the dress and hairstyles of hundreds of Native American tribes. 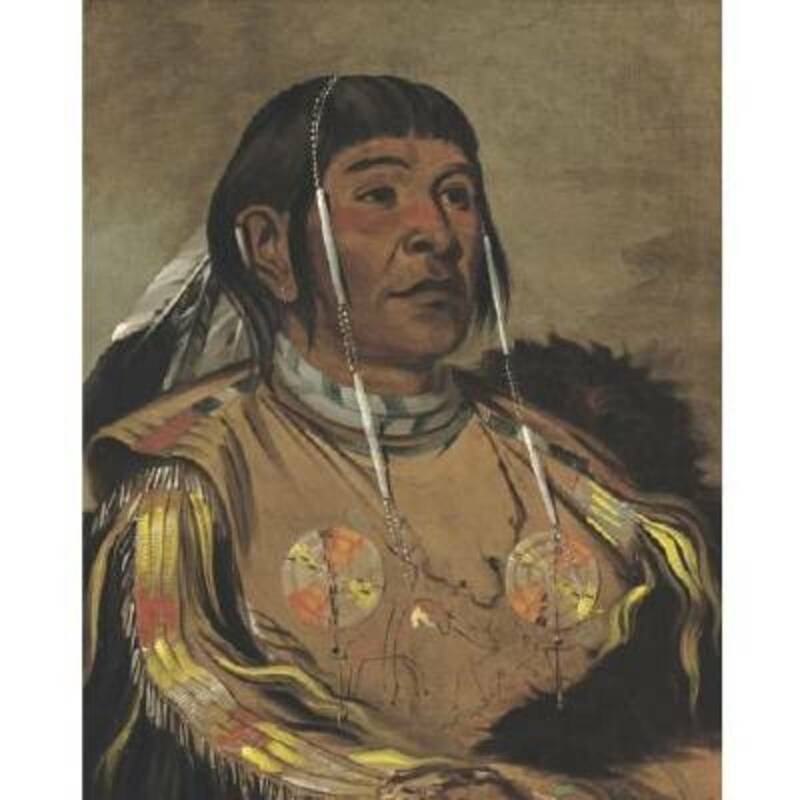 George Catlin was most well known for his comprehensive ethnographic portraits of 48 distinct Native American tribal groups. He traveled for 8 years and produced over 500 portraits depicting Native Americans in full regalia, capturing their dress and hairstyles for posterity before the Civil War and before the Mormon emigraion to Utah. At that time, traveling through Native American lands was dangerous, but Catlin traveled among tribal groups with greater safety than most other settlers of European descent. 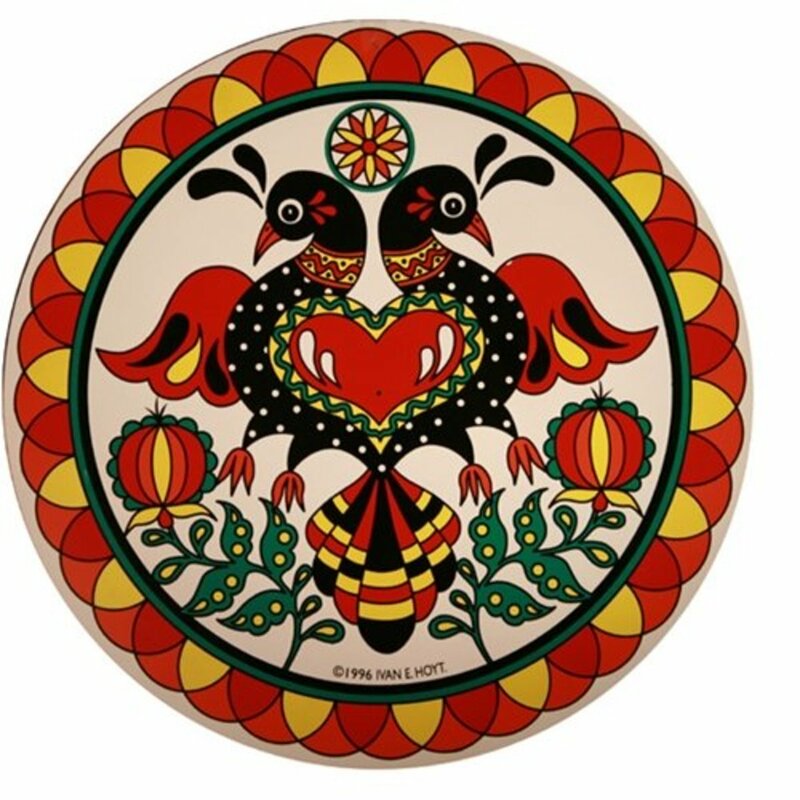 This was because the Native Americans valued Catlin's record of their tribal societies. Catlin's work is considered equally important for its historical/ethnographic content, as well as for its finely executed realistic depictions of hundreds of subjects. Catlin was a painter who worked in oils and watercolor, and he specialized in printmaking. His work is well preserved and prolific due to the existence of these prints. The Smithsonian American Art Museum, Washington D.C.
Alfred Bierstadt, "Bridal Veil Falls"
Albert Bierstadt was a German-American painter best known for his romantic landscapes. 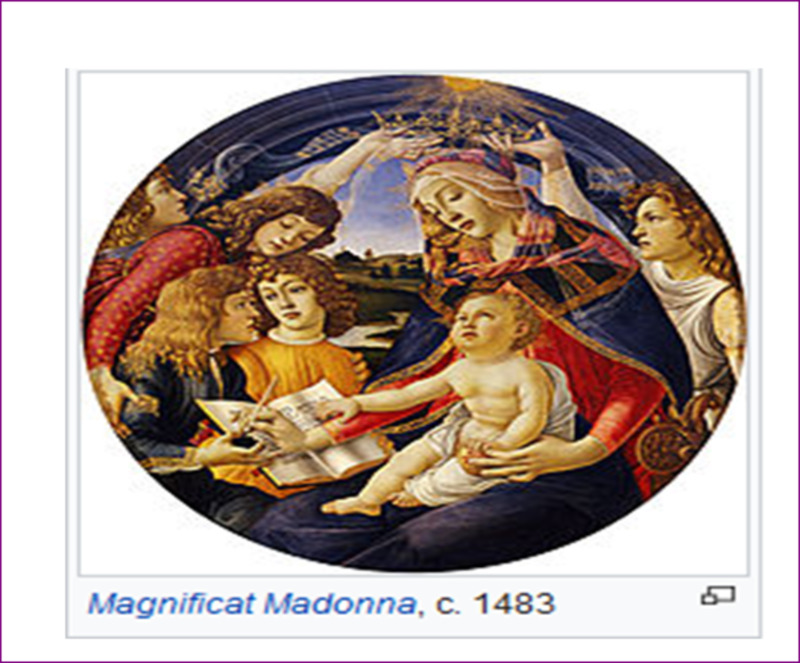 He was a prolific artist and was very financially successful during his own life. One of his commissioned paintings brought him $25,000 over 150 years ago. 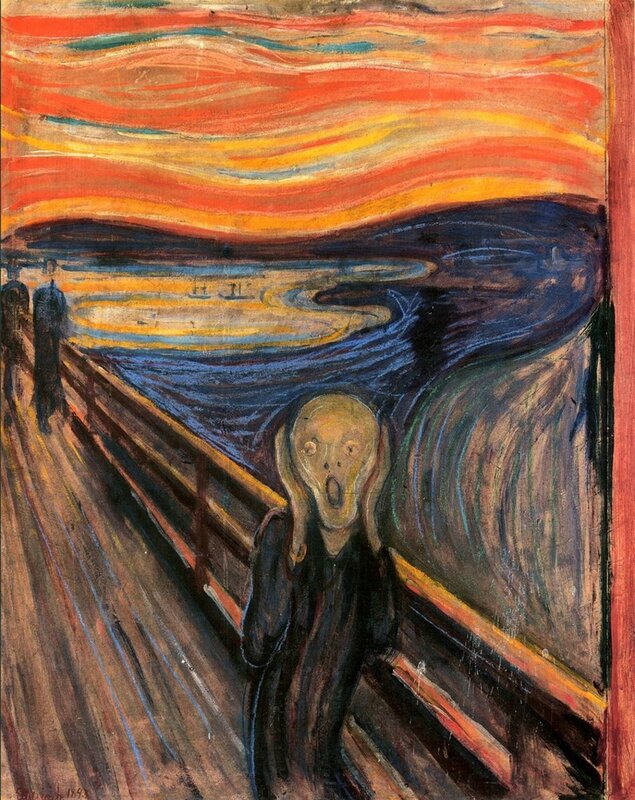 That's a lot of money now, but it was an astronomical sum for a painter in the 19th century! Bierstadt's popularity was well justified. His beautiful landscapes manipulate light in a technique called "luminism." His paintings of beautiful places like Yosemite, Yellowstone, Californian landscapes, etc., often use strong contrasts of light and darkness in a technique called "chiaroscuro," which is an Italian term usually applied in art history to portrait paintings. Personally, I think the technique fits Bierstadt's European influences. 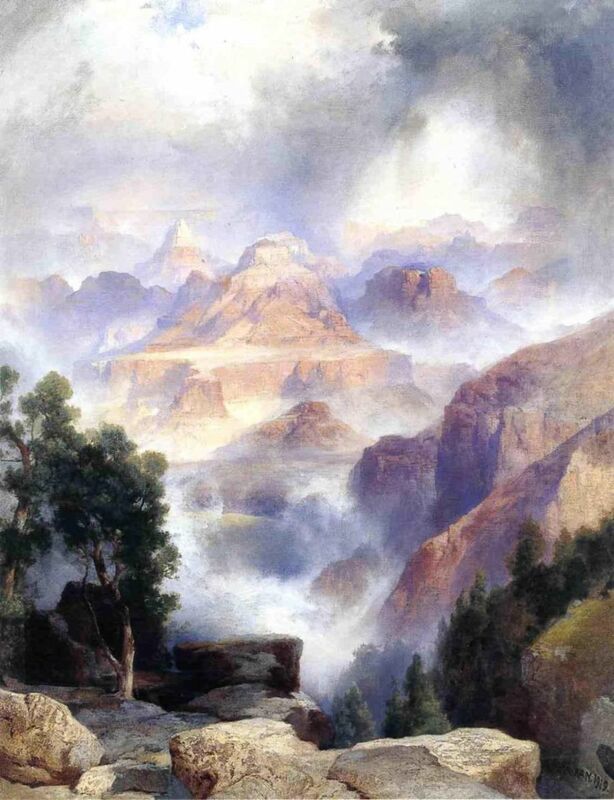 Bierstadt used this effect to create romance and grandeur in his landscapes. His work fueled the imagination of many Americans who settled in the West, and his paintings helped Easterners appreciate the lands that later became a part of the U.S. National Park system. Bierstadt belonged to a group of painters known as the Hudson River School, and he worked in many media, including oils, pastels, watercolors, gouache, charcoal, and inks. His prolific output, popularity, and status—not only during his time but also today—mean that his works now appear in over 100 museums across the United States. 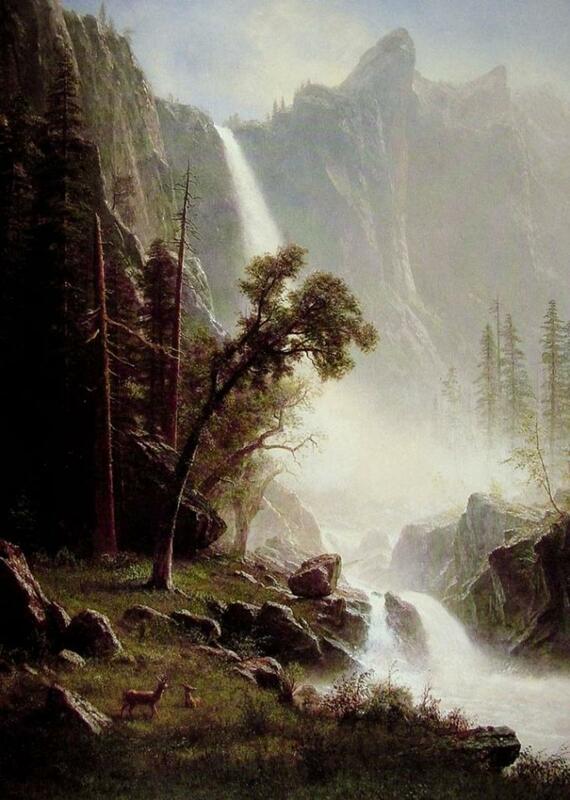 Bierstadt is one of my personal favorite artists. His paintings of Yosemite are inspirational. Thomas Moran, "Showery Day Grand Canyon"
Thomas Moran, "Cliffs of the Upper Colorado River"
Thomas Moran was an English-born landscape painter who immortalized his Western landscapes like Albert Bierdstadt. Moran emigrated to America with his family when his father's job as a loom operator became obsolete during the height of the Industrial Revolution. 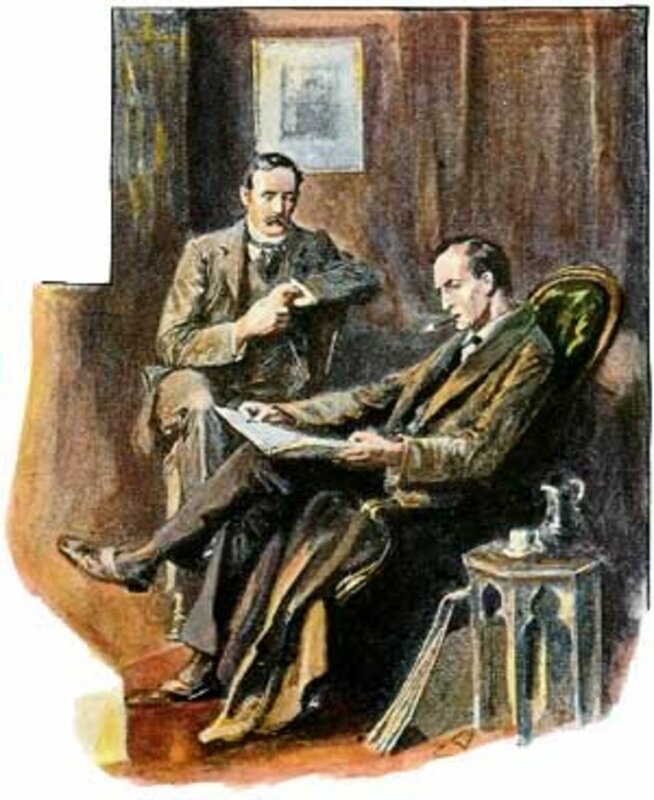 Thomas's brother Edward was also a painter. Moran's signature style of painting with intense shades of color was especially effective in capturing the awesome grandeur and drama of Grand Canyon and Yosemite National Parks. These parks form the backbone of his landscape work. His landscapes often depict steep and dramatic mountains, rock formations, and natural wonders—often with dark clouds. His paintings carry a high sense of drama. 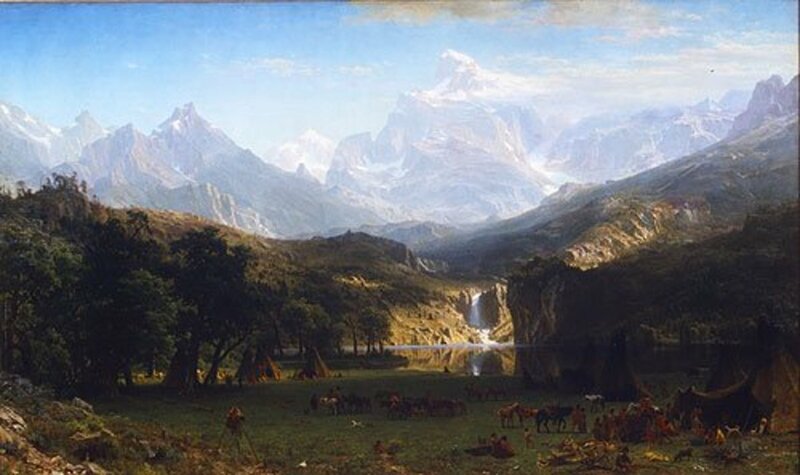 Look at Moran's paintings closely and then compare them to Bierstadt's. Can you see the stylistically different treatment of similar subjects? Moran made many trips to the national parks of the Western United States, and in later years, his status as the artist of the Grand Canyon was immortalized by the Burlington and Northern Railroad in its advertisements. Moran was adept in many artistic media, including gouache, watercolor, oils, printmaking, engraving, lithography, and watercolor. Moran's work is featured in over 100 museums in the United States. 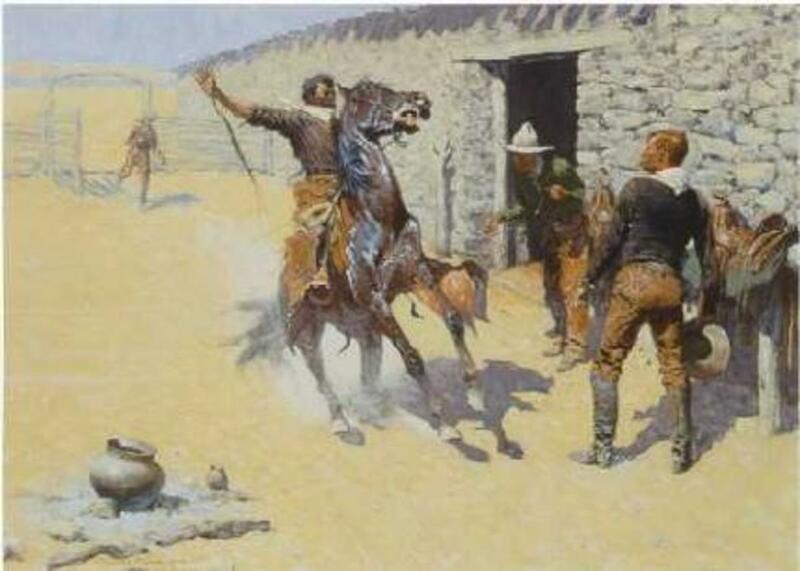 Frederic Remington, "The Trooper." 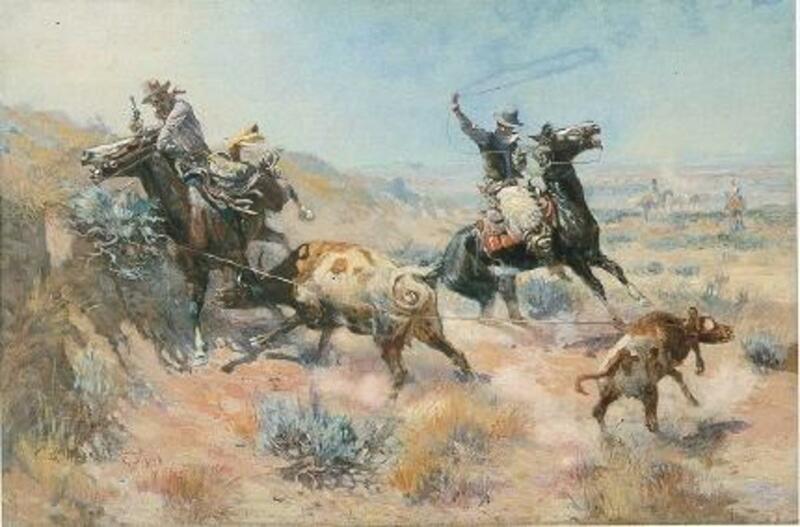 Remington had a flourishing career illustrating stories of the American West for magazines. Frederic Remington, "The Apaches." 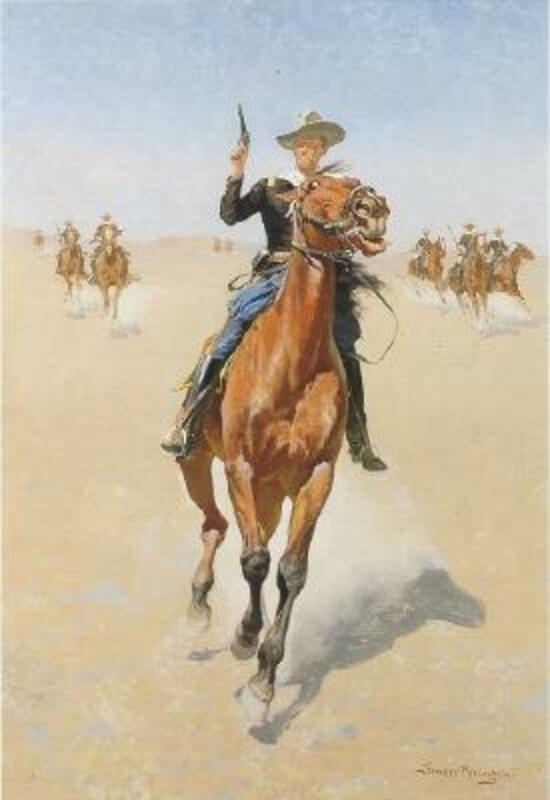 This painting shows Remington's flair for the dramatic. His paintings often tell a story. Born relatively late in the 19th century, Frederick Remington always knew he wanted to be an artist. At age 15, he attended a military academy in New York State. According to his biographers, Remington moved out West to prove his merit as an artist to his fiancee's father. He bought a saloon in Kansas and was bamboozled, but he eventually established a flourishing career as a fine artist, journalist, illustrator, and even war correspondent. He also got to marry his sweetheart! Remington was both a painter and a sculptor. 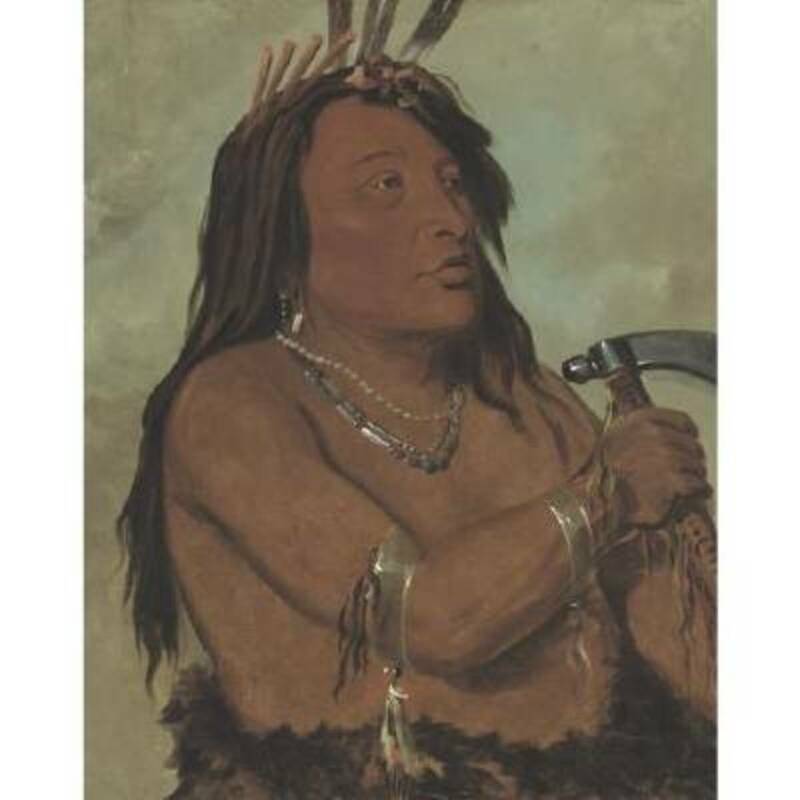 His subjects often included cavalry officers, Native Americans, and horses. His cast bronze sculptures were reproduced at forges and sold in multiple copies in a series, similar to the idea of print making. He made all of his bronzes during the last 10 years of his life, which ended at the untimely age of 48 due to health complications. Remington was fascinated by what he called the "Old West," and he traveled in the West during his adult life collecting subject material. However, I am always struck by the almost manicured portrait of an artist wearing a stiff, Eastern suit. Ironically, this man defined the art of the West and still commands a grand seat as one of the big granddaddy's of Western art, yet he remained more an observer than a participant in the actual Western lifestyle, preferring to do most of his work in New York City. 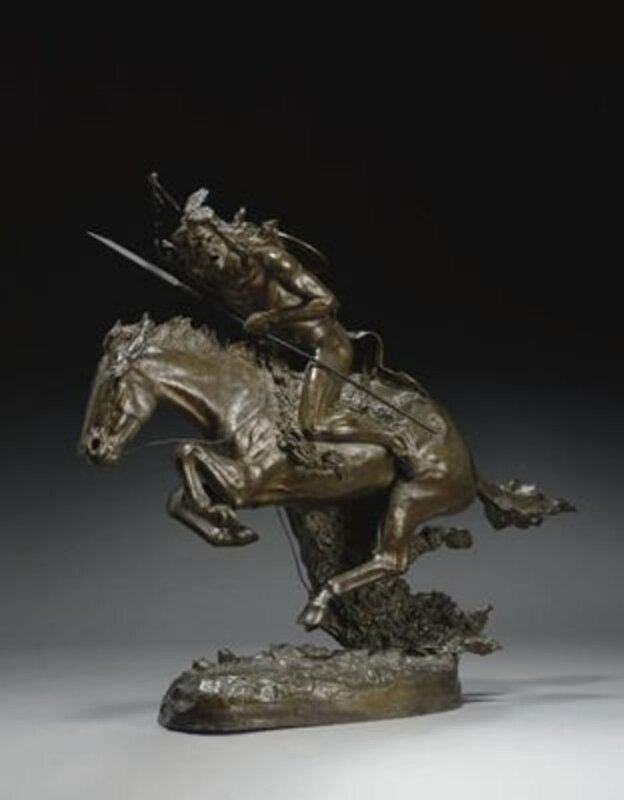 Frederick Remington's artwork is featured in over 80 museums across the United States. 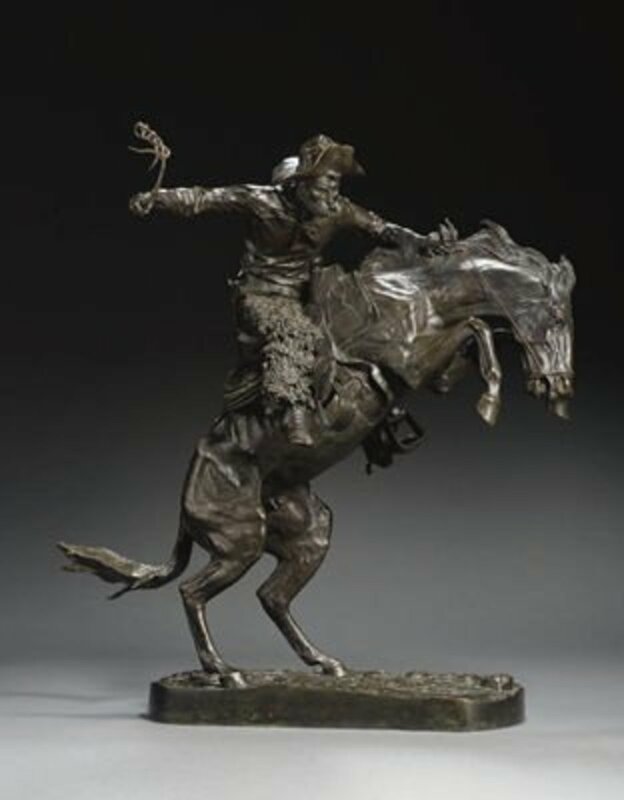 Frederic Remington, "The Bronco Buster"
Just came across your hub while researching American West art for my latest western mystery book. I needed informed references to Western art that might have hung in the home of an eccentric character living in Denver in the 1890s, and you supplied everything I needed and more. Thank you. All of these painting that you have featured are amazing, and I had seen several of them. Albert Bierstadt is new to me though, and I feel as though I was missing out. Thank you for that introduction. Beautiful hub! What a wonderful tribute to your grandparents. Try checking on the websites of the Phoenix Art Museum, the Gilcrease Art Museum, Buffalo Bill Museum in Cody Wyoming, or the Eiteljorg museum in Indianapolis. These museums have extensive westeern collections and perhaps you will find this painting among their online collections. Another idea is to look at a poster website such as allposters.com. An easy way to search for this image might be to use Google images and do a text-based search using your keywords. I am not familiar with this work of art but I will ask my husband who was the collections manager at a western art museum for several years. Maybe he will know. Good luck. If he does know something I'll post back here. I am searching for a copy of a picture I have seen many times (until I need it). It depicts a young lady in a long dress standing in a field, she is holding a bouquet of wild flowers and her cowboy is approaching her in the distance on his horse. I want to have it etched on my grandparent's grave marker as it tells their story. What a great hub. I love history and found this to be awesome! Hopefully a good one, but we will miss the West. Iowa will be a change. I was born in Des Moines. I'm not at all worried about that Dahoglund. You'll do an exceptional job and I'm looking forward to reading your new hubs! Good luck and enjoy your new project! We are moving to Iowa at the end of September/early October and having another baby about that time. I might just have to change my name to wannabmidwestern! Hope all is well for you and enjoy your writing! Regards. You have a well presented list of artists here.I have just started a series of hubs on primarily artist who portrayed American Indians. Except for Catlin. I don't think I am duplicating you at all. Thanks for that comment hwire. If it were a longer list I would have gone there. Check out my 20th century list that is similar to this one. Georgia O'Keefe is on there, and Minerva Tychart (sp?) isn't on that list but she could be. i agree with your opinion of these artist but i can't help to ask what about the women? Thanks GMA Goldie, I'm glad you liked it! LOL Ozark! Thanks for your comment. Those is some really amazing artwork! Thanks for the clarification Nickny79--your point is well taken. We tend to be pretty Amero-centric out here in the "West". Your use of the term "Western" is a little misleading...the term unqualified sounds in the distinction between Western as in Western culture as opposed to, say, the Orient. You might consider rephrasing to "the American West." Yes, and they are only a small sampling of the works these artists have created. Most of these artists were prolific. Thanks for commenting! Wow, those are very great materpiece. I liked Thomas Kincaid at first until he pimped himself out via Hallmark. I know artists have to eat like the rest of us, but some artists find some successful niche and then stop producing creative work. I am not familiar with R.H. Palenske and am looking forward to seeing some of his work. Interesting comment! My vote is for Catlin and Remington. Moran is nice, but I think I've seen too many similar paintings, so much so that one looks the same as the next to me. I do not pretend to know whose pictures I've seen. I tend to get tired of painters/artists who have a theme, which, initially is very nice, but then it just becomes another version of the original, such as Thomas Kincaid (sp?). R.H. Palenske did a lot of prints/etchings mostly western/animal themed, but I came across a portrait he did of a very old woman. It was so detailed you could see the veins under her skin, her hands were folded in prayer, and it was titled 'Prayer for Peace'. I adore this stray from his usual works. Thanks for sharing, great hub! Frederick Remington is near and dear to my heart, as I have grown to know his works through the only monumental statue he procuced in his life, which is in Fairmount Park in Philadelphia...The Cowboy. Wonderful hub. I'm off to view the next in your series. Thank you, Desert Blondie, for adding your knowledge. Moran indeed played a strong role in building PR for the national park system. It's interesting to see how much art is &quot;pure expression&quot; and how much is PR--whether for the artist herself, some cause, or an institution. 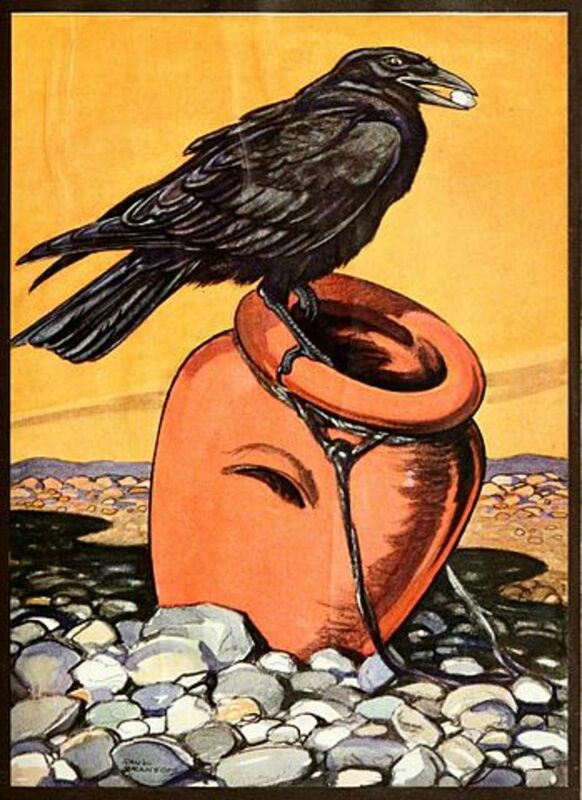 I think Remington played a similar role within the art world. 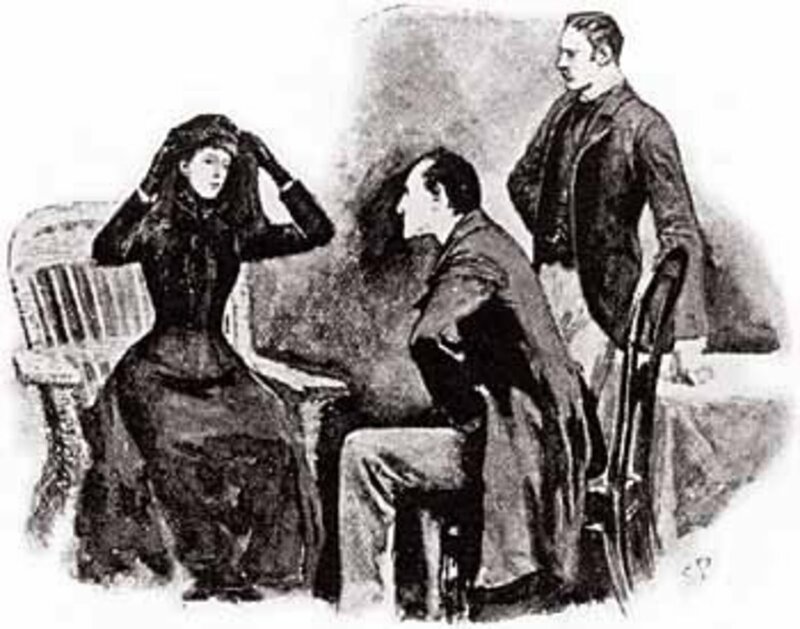 Much of what he painted was idealized, too, and many of his drawings were commissioned. His work swayed the ideology of the masses as well. &quot;Art for art's sake&quot; is a luxury for the very few. Thanks for your interesting commentary! Just to presume to add to the richness of your hub....Moran did NOT actually travel to the "national parks." In reality, he was commissioned to go to the lands that Theodore Roosevelt and assorted Congressmen HOPED would become the be added to the, then small lands already in the National Parks system....His paintings of these fantastic sites were used to show those in Washington the treasure of these lands....one reason some of his paintings so absolutely huge...to show the majesty to the politicians. Many of his paintings, also as part of the National Parks agenda, toured the eastern USA to help build "man on the street" support and enthusiasm for the tax dollars that would be used to enlarge the then small National Parks Act. So, to Moran...our salutes...think of what his talent did for the USofA!!! As an Oklahoman, the "milieu" of Western Art is as treasured in our state as Garth Brooks' music...well, almost. Wow, wannabwesternfan, I didn't know that. Thanks for the info. Kerry G and jacobworld, thanks for the compliments. 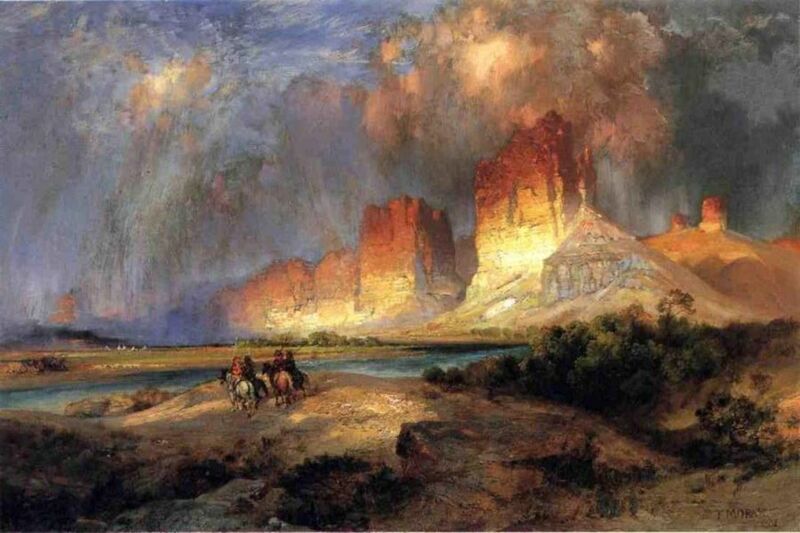 I like Remington and Russell but my heart goes to the romantic paintings of Thomas Moran. 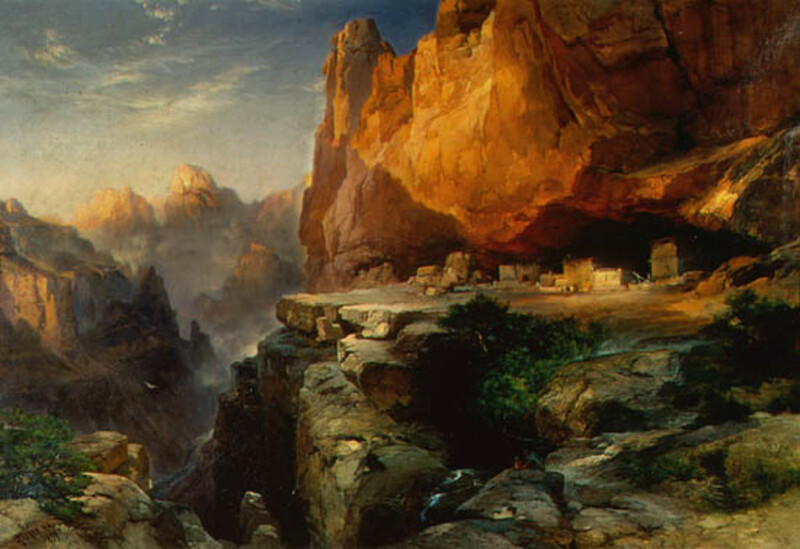 I love Bierstadt's otherworldly quality but Moran's style is soooo dramatic and emotion-filled. Lovely hub and introduction to the topic! I am especially fond of Russell and Remington. Very readable introduction to what could be a &quot;high brow&quot; topic. I am looking forward to the next 5. BTW did you know that Thomas Moran's other brother Peter was also a painter? All, this hub was originally going to feature 10 artists, but it was too graphic-intensive. Stay tuned! Which artist was your favorite?